Read about the 2019 RAM HD 3500 Chassis Cab and see how it matches up against the Ford F350 and the Chevy Silverado 3500! The 2019 Ram Chassis Cab offers the highest capability, advanced technology and comfort in the commercial truck market. If you are looking for a durable, capable, and impressive cabin space, the Ram Chassis Cab trucks are well worth a look. This model boasts segment-leading towing capacity up to 35,220 pounds, upfitter friendliness, great fuel efficiency, and so much more. Read on to learn more about the 2019 RAM Chassis Cab and how it compares to others in its class. How does the 2019 RAM Chassis Cab compare to Ford and Chevy? 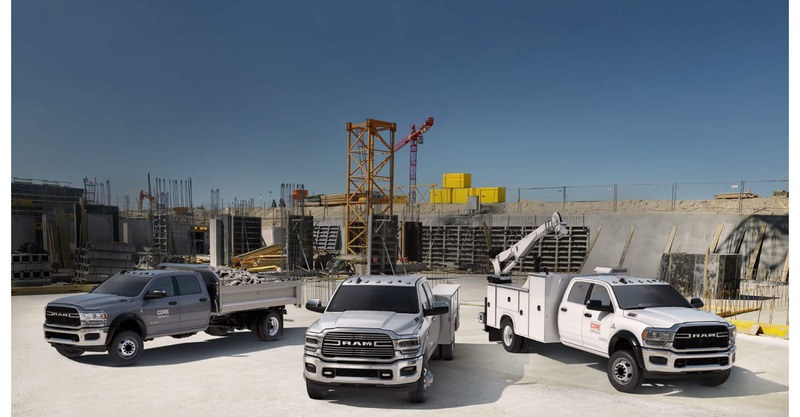 The Ram Chassis Cab beats out the competition in some of the most important capability aspects of the segment -with class-leading 35,220 pounds of towing, highest Gross Combined Weight Ratings of 43,000 pounds and a payload of 12,510 pounds. The new Cummins 6.7-liter I-6 offers improved power and fuel efficiency with 360 horsepower and 800 lb.-ft. of torque - the highest available torque in Class 4 and 5. Let's take a look at how the RAM Chassic Cab stacks up against the Ford F-350 and Chevy Silverado 3500. The standard engine under the 2019 Ram 3500 Chassis Cab is6.4-liter Hemi V8. It puts out up to 410 horsepower and 429 pound-feet of torque. It even features Fuel Saver Technology to give you better gas mileage.The technology works by shutting off half of the cylinders when they are not needed. Efficiency is also improved by a Deceleration Fuel Shut-Off technology, which stops the fuel flow to the cylinders when decelerating.If you are looking for more power, or specifically want a diesel-powered truck, there is a Cummins 6.7L inline-6 turbodiesel engine as an option. It pumps out 360 horsepower and a whopping 800 pound-feet of torque. The TorqueFlite 8HP75 eight-speed automatic transmission is standard, and is the first time an eight-speed automatic transmission is offered for the 3500 Chassis Cab. The 2019 Ram Chassis Cab is one of the most technologically advanced in the segment. Its tire pressure monitor system can track up to six tires on the truck plus trailer tire pressure monitoring for up to 12 trailer tires.2019 RAM 3500 is the only truck in the segment to offer an array of active and passive systems. It is the only Chassis Cab in the segment that features Adaptive Cruise Control, Forward Collision Warning, Automatic Emergency Braking (AEB) and AEB with trailer brakes available on all trim levels. If you are in search of a commercial chassis cab-style truck that you can count and that will serve all of your needs, the 2019 RAM Chassis Cab 3500 is a sure bet. If you have questions about this model, would like to learn more about it, or would like to view one in person, Golling Dodge Chrysler Jeep RAM is standing by. We have a great selection of commercial work trucks. Fill out our online contact form, or give us a call at (877) 233-6493!